If you have an active Company Profile at a subscription level that lets you post Jobs and/or Trainings go to the My Account dropdown and click Company Profile to access your profile to post. OutdoorEd.com is the most comprehensive outdoor education directory on the Web. Make sure that your program gets noticed. AEE Jobs - $99 for a single 60-day job posting. NO detailed Company Profile. Bluefish Jobs - $175 for members or $300 non-members for a single 60-day job posting. NO detailed Company Profile. We are excited to extend a new benefit to all active US Company Profile Subscribers: You are now eligible for group level gear discounts through a Group Account on College Outside. College Outside is the only retailer that is intentionally designed for Outdoor Education. They specialize in group purchases for Outdoor Recreation organizations and work directly with brands to ensure the lowest pricing. College Outside takes the struggle out of gear purchasing. With no minimum order requirements and a streamlined order process, College Outside makes it easy to order gear for your organization. Plus, with one vendor setup, one purchase order, multi-brand quotes, and one invoice, it's as easy as shopping online for your own gear. Only available to professional outdoor education programs. All applications are vetted before approval. When people search for outdoor education, search engines bring them to OutdoorEd.com. Here are some of the great benefits of a Company Profile on OutdoorEd.com. Mobile-Ready: The site is built on mobile-first design principles so it displays equally well on phone, tablet and PC. With over 40% of users now accessing the Web from a mobile device this is essential to ensure that users can easily browse our site from any device. Videos & Images: You can now include YouTube or Vimeo videos right in your profile and post multiple images of your program or facility an a rotating Image Gallery. Best Company Profile: We offer the most expansive profile information about your Company or School. If you have a facility-based operation you can include details about your facility—everything from challenge courses and climbing walls to conference facilities and waterfront. That means people searching for particular types of facilities can locate you based on your facility offerings. If you are a school that offers degree-based programs, you can provide detailed information on your degrees offered (associates, bachelors, masters, or doctorate) as well as topic areas helping potential students find your program. Our Control Panel makes it easy to post Jobs or Trainings and to duplicate items that you repeat. You can even schedule items to be posted in the future and on the scheduled start date, they’ll appear on the site. Enterprise Search: Our unified enterprise search system means that everything in teh site is searchable from any page. Looking for information on risk management? Search and you’ll find articles, blogs, news reports, videos, trainings, and jobs that require risk management skills. Enterprise search means that your Company Profile, Job Postings and Training listings are included in all searches if keyword is found, not just specific searches on Jobs for example. 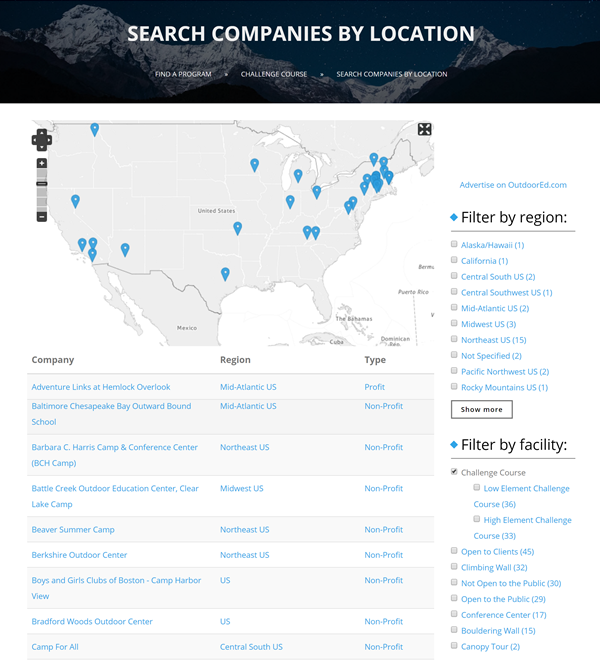 Drill-down Searches: Users can easily use our faceted drill-down search capabilities to search for details like Region, Job Type, Training Category, Company Location, etc. across Company Profiles, Jobs or Trainings. Job Postings: If you have a Standard or Premium Profile you can post UNLIMITED Jobs for an entire year. You can include Video on your postings to tell the story of your organization. You can turn Job Postings on or off as needed by changing the publication dates which means you can easily reactivate jobs you need to repeat by just changing the publication dates. If you have lots of Jobs with similar information, you can Clone an existing Job and then just make small changes. Training Listings: If you have a Premium Profile you can post UNLIMITED Trainings for an entire year. This is great for organizations that offer Training Courses to the public and are looking for clients. Control Panel: Your personal Control Panel gives you access to your Company Profile and any Job Postings or Training Listings. We maintain your Jobs or Trainings so you can edit/reactivate them at any time. Don't spend time retyping information from a Job you need to post every year. Just reactivate an unpublished Job and update it. Email Subscriptions for Jobs & Trainings: Users can save the Job or Training searches and be automatically emailed on a daily or weekly basis when new postings come in that match their search criteria. This is expands the reach of your postings. Weekly Job Newsletter: New Job Postings automatically go out to subscribers on our Weekly Jobs Newsletter. Single Sign-on & Multiple Users: OutdoorEd uses a single sign-on to access the entire site so purchasing a Company Profile and accessing your Company Profile, Jobs or Trainings all happens from a single user account. We’ve also added the ability to have multiple people access your Company Profile Account so multiple people in your organization can post or edit content. If you forget your password, there’s a password reset option to get you back on quickly and easily. If you don't have an active Company Profile, go to the Outdoor Ed Store to purchase yours today and get posting!